Today at The Walking Dead panel in Hall H at Comic-Con International: San Diego, AMC revealed three new, distinct walkers who will appear in The Walking Dead Season 7. At the panel, Executive Producer Greg Nicotero said he’s particularly proud of the “Hitchcock” walker, whose eyes have pecked out by birds. 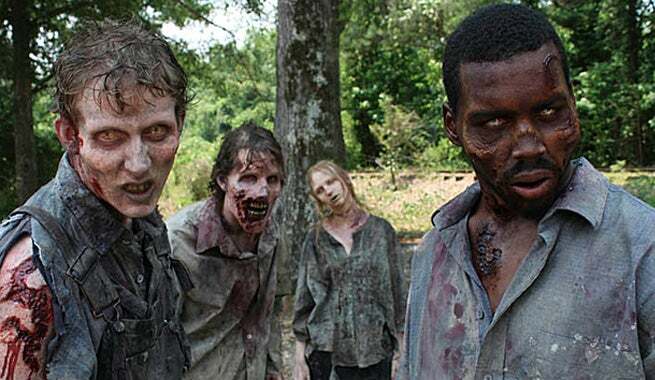 Executive producer Gale Anne Hurd took the opportunity to note that The Walking Dead’s special effects team was once again nominated for the Primetime Emmys. Check out the Walkers in the gallery below. The walker reveal immediately preceding the release of the first full trailer for The Walking Dead Season 7, which offered fans their first look at Ezekial and Shiva. The Walking Dead Season 7 picks up where Season 6 left off, with Negan killing a still unidentified member of Rick’s group. Will it be the same death as in The Walking Dead #100, or will The Walking Dead TV series surprise fans by going in a different direction? Over the off season, four cast members were promoted to series regulars – Tom Payne, Austin Amelio, Xander Berkeley, and Negan himself, Jeffrey Dean Morgan. Earlier today, AMC also revealed when The Walking Dead Season 7’s premiere date, so now at least we all know how long we have to brace for the bad news. The Walking Dead airs Sundays at 9 p.m. ET on AMC. For quick updates and photos from The Walking Dead's panel, set, and show floor, check out The Walking Dead on ComicBook.com's Facebook page!